When I opened the first marker the tip was brown, not the color I ordered. Is the marker defective? A: No. Brown is the color of our synthetic NIB (tip), and our FELT tip is white before the marker is primed. You need to prime the tip before using it, simply press down on it and wait until it is full of ink. Why was the tip dry when I took it out of storage? 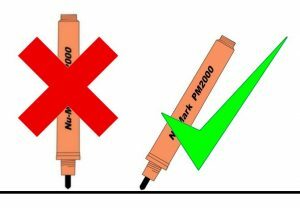 A1: When storing an activated marker, make sure that the tip is wet before storing the marker, and make sure the Cap is securely fastened. A2: Our ink is formulated to be fast drying. 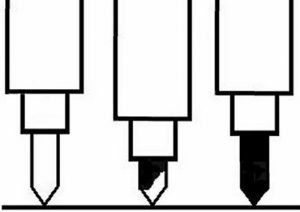 The first few times that you use the marker the NIB (tip) is not fully saturated. Until it is it has a much shorter “wet” storage time. A3: As shown below, the volume of ink at risk of drying out in the tip of a valve action marker is substantially less than what is available with a typical marker. 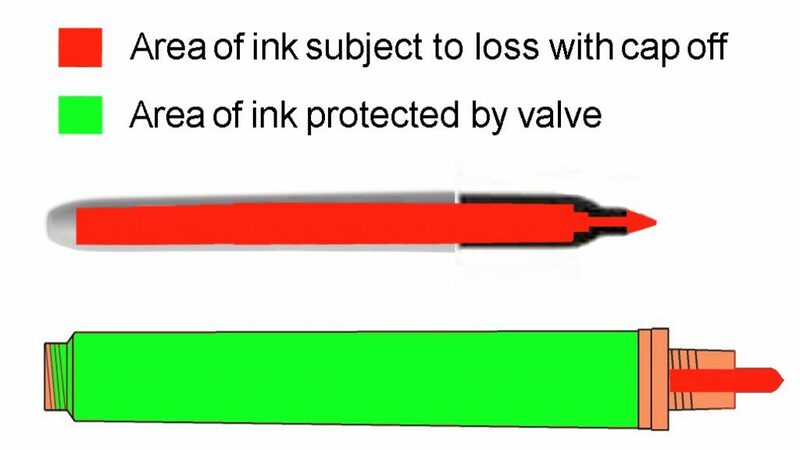 The majority of ink is protected by the valve, only being released when the user requires it. How do I restart a tip that has dried up? A: Flip the tip. Using tweezers, pliers or a folded piece of heavy paper, flip the tip around, pump the tip and hold down until it looks wet. Then flip the tip back and repeat, install cap and wait another 30-60 seconds for ink to soften dried material. If you are using the marker in a warmer environment (80°F+) this may take longer to recover. If the tip does not recover, or does not recover fast enough, replace the tip. Why does the marker spit out ink when I try to prime it? A: Pressure built up inside the barrel, usually due to temperature change, forces the ink out when the tip is pressed. 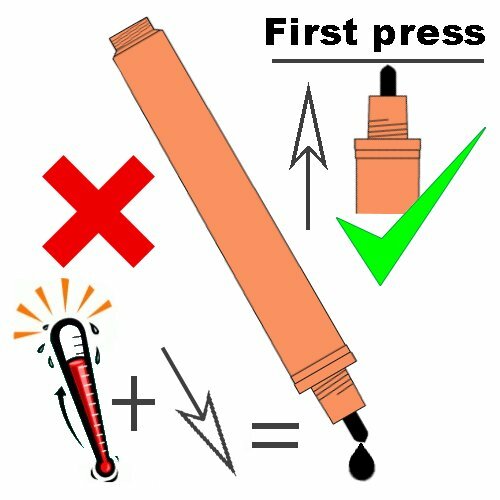 Pressing the tip while it is “upright” will release the pressure without discharging ink. Why is the marker leaking when I use it? A1: Are you Left-Handed? 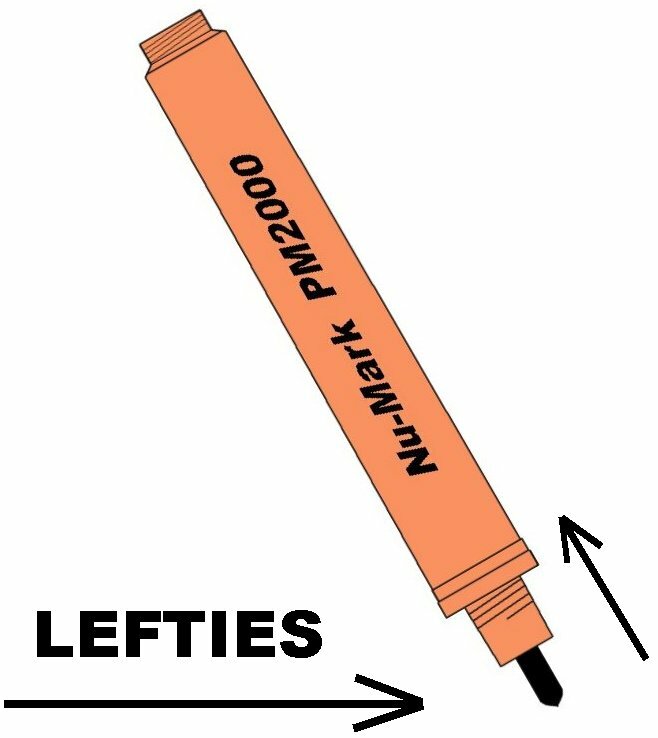 Lefties “push” the marker when writing. This puts pressure on the tip in the same direction as required to open the valve. This is more of a problem when writing on rough surfaces. – Try holding the marker at a different angle. A2: The tip may be “sticking” and holding the valve open. While the tip is upright, using pliers or folded paper, try removing the tip and rotating it while re-installing. A3: Hold the marker at an angle to the surface while using. DO NOT hold the marker perpendicular to the surface as any pressure applied will open the valve and cause excessive discharge. Why do your caps screw on when all the other markers we have seen have push on caps? A: We believe that the screw on cap is easier to remove “one handed”. Pushing against the pocket clip, you can easily unscrew our cap with one hand, without putting the cap in your mouth…. Yuk! HINT: pre-loosen the cap prior to first use. Why do your Black permanent markers last so much longer in the sun? A: We use industrial quality dyes and resins in our ink. Our Black marker contains more dye than most other brands. 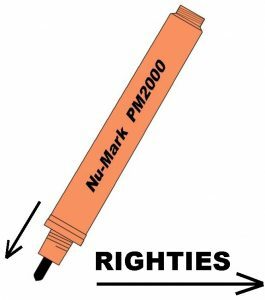 That is why our Nu-Mark marker leaves a darker line, and why that line lasts longer in the sun. Why do the Red, Blue and Green permanent markers look black on some surfaces? A: The dyes used in markers are “translucent”, light passes through them, so the surface color is “added” to the marker color. Not a problem with Black ink as adding any color to Black results in more Black. If you are writing on brown card board (for instance) it will make most ink colors look black. -Paint markers contain solid pigments which reflect light. They will retain their color (with slightly different tone) on most surfaces. How do I remove an ink mark? A: That depends on the ink and the surface it is on. Solvents and light oils may work but can damage the surface in the process. Always test a cleaning agent or solvent on the surface before wide spread use. Porous surfaces are the most challenging and may require mechanical removal which will damage the surface. Can I use the Permanent marker tip in the Paint marker? A: No. The tips are of different designs and have different flow rates. Ink is a “solution” which is thin and wicks easily, Paint is a “suspension” of particles which is thick and requires larger pores to flow. How long will your markers last in storage? A: The fact is we do not know for sure yet! The only real test is time. NuMark Company began archiving markers for this purpose in 1992. We have one left which we use in our shop. As of the writing of this article that is 24 years! How should I dispose of empty markers? A: Check with your local authorities. If the marker is empty it is likely considered non-hazardous and can simply be put in with your trash. Why does the Nu-Mark Marker write on oily metal when others will not? 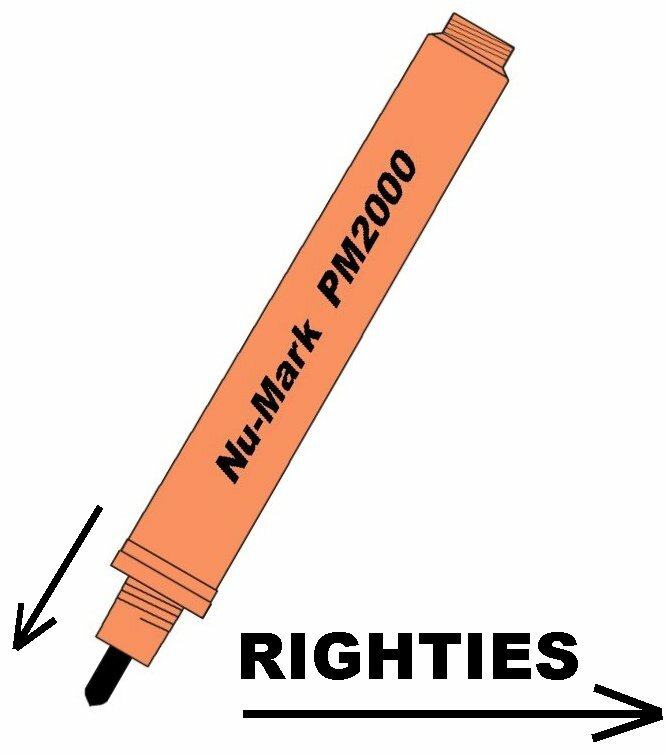 A1: Our PM2000/PM2000F/MM3000 will write on oily surfaces because their ink contains Xylene. Our formula works with Xylene to disolve the oil and make it part of our ink! Will your NuMark Marker write upside down? A: YES! In fact most markers will, at least for some period of time. You will need to turn the marker “tip down” and press on it to re-prime the tip as needed.